An integral and forgotten component of the famous Bill Barilko overtime goal that sealed the deal for the Montreal Canadiens, Tod Sloan actually netted the game’s tying goal – his second of the game - in the last minute of the third saving Toronto, allowing Barilko to become the hero in overtime. 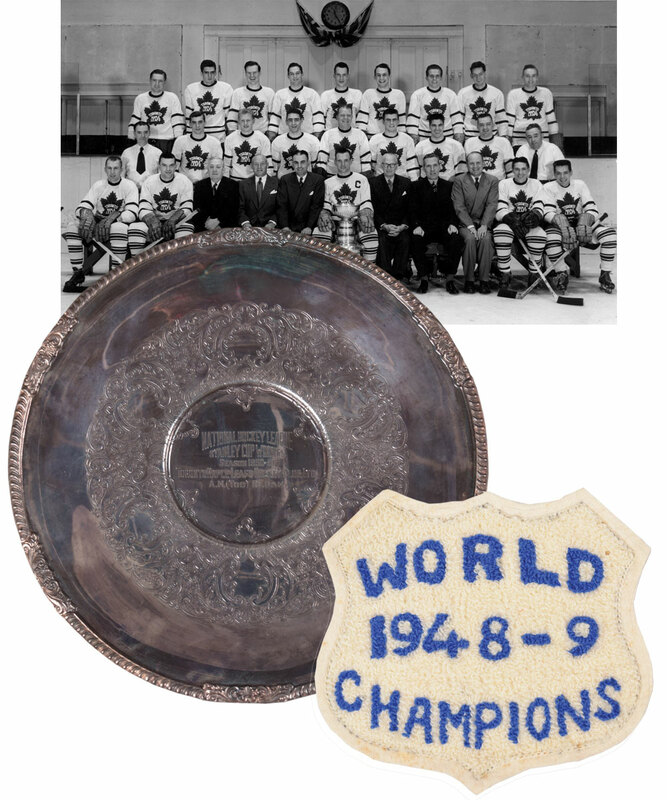 Hailing directly from the Sloan family, we have a 1950-51 Toronto Maple Leafs Stanley Cup championship tray that was presented to Tod, along with a 1948-49 “World Champions” crest. At 12” in diameter, the elegant keepsake features intricate detailing with chased features, with the particulars engraved within the center including “Stanley Cup Winners Season 1950-51” and “A.M. (Tod) Sloan”. The reverse has hallmarks stamped along with "S.P.-Copper" (silver plated on copper) and "Sheffield Reproduction". An LOA from the Sloan family will accompany. The tray exhibits basic oxidation and tarnishing, with no obtrusive damage and is accompanied by an “Alex Falls” cloth bag. The 4 ¾” x 5 ¼” crest is most likely from a jacket and made of layered canvas, felt and chenille, with “World Champions” and “1948-49” in blue, with just some toning and very light staining present.